Gandalf on Sovereign Plans | Redeemed! Near the beginning of The Fellowship of the Ring, Gandalf the Grey has a very frank discussion with Frodo, in which he explains much of the history and nature of The Ring of Power. Within this conversation, Tolkien sets the stage for the remainder of The Lord of the Rings (LOTR) trilogy, while providing insight into some profound truths revealed throughout this work of fiction. It was the strangest event in the whole history of the Ring so far: Bilbo’s arrival just at that time, and putting his hand on it, blindly, in the dark. There was more than one power at work, Frodo. The Ring was trying to get back to its master. It had slipped from Isildur’s hand and betrayed him; then when a chance came it caught poor Déagol, and he was murdered; and after that Gollum, and it had devoured him. It could make no further use of him: he was too small and mean; and as long as it stayed with him he would never leave his deep pool again. So now, when its master was awake once more and sending out his dark thought from Mirkwood, it abandoned Gollum. Only to be picked up by the most unlikely person imaginable: Bilbo from the Shire! Behind that there was something else at work, beyond any design of the Ring-maker. I can put it no plainer than by saying that Bilbo was meant to find the Ring, and not by its maker. In which case you also were meant to have it. And that may be an encouraging thought. This complex interworking of plans of conflicting powers is carried throughout the remainder of the LOTR trilogy, but is seldom expressed so clearly as here. We have, first of all, the individual wills and choices of both Gollum and Bilbo. The ring may have slipped unbidden from Gollum’s finger, but Gollum himself failed to notice the slip and failed to take preventative action to secure the ring. Moreover, Gollum chose to leave his hidden underground lake to capture a goblin. Bilbo, for his part, discovered the ring completely by accident, yet made a deliberate choice to pick it up and place it in his pocket. Beyond that, though, were a whole series of choices by Bilbo, beginning with the decision to join Thorin and Company, that resulted in his being in the exact place at the exact time to encounter the ring after it slipped from Gollum’s finger. Then we have a plethora of seeming random events and choices involved, from Gandalf’s selection of Bilbo to share the dwarves’ adventures to Bilbo being unseated and banging his head in the dark, during the surprise goblin attack from behind. Somehow, in the midst of all those seemingly random events and decisions by multiple persons, we have the evil will of The Ring responding to the will of its maker, to be reunited with its evil creator, Sauron. A dark and evil pair of wills pursuing gratification through the seemingly random choices and events of everyday persons. The ring and its maker had their evil designs. Yet there was a greater power at work… a power with a better understanding of Bilbo’s heart…a power with the ability to use the evil plans of Sauron to thwart him and accomplish plans for good. Yet, despite Gandalf’s deep awareness and conviction of the sovereign plans of a higher power, there is no sense, at all, of fatalism. 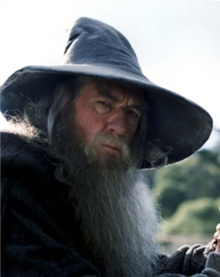 Rather, Gandalf continually responds with a call to action and frequently expresses the need for urgency in combatting evil. The assurance of the plans of a sovereign higher power being carried out through our daily choices in no way lessens our responsibility to act for good and against evil…rather it heightens our responsibility. ‘Well, well, he is gone,’ said Gandalf. ‘We have no time to seek for him again. He must do what he will. But he may play a part yet that neither he nor Sauron have foreseen. For things beyond his control, Gandalf seems to place great confidence in divine power to work all things for good. And, of course, Gollum’s escape turned out to be a very good thing, in the end. Despite Gollum’s selfish intent, his actions were essential to the accomplishment of the mission and the overthrow of Sauron’s evil power. Without Gollum’s betrayal, both Frodo and all of Middle Earth would have succumbed to the power of The Ring. I find courage in knowing God is working within me for the fulfilment of His plans, and I find serenity in knowing the many things beyond my control are still in God’s control and still subject to His plans. This entry was posted in God's Position toward Us, Redemption, Tolkien's Wisdom and tagged courage, covenant, darkness, destiny, encourage, encouragement, faith, free will, gandalf, god, God's will, lord of the rings, lotr, predestined, redeem, redemption, sovereign will, tolkien by joe. Bookmark the permalink.